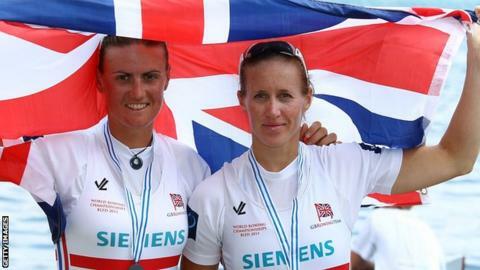 Olympic champions Heather Stanning and Helen Glover said they were relieved to win their first world title together after a difficult season. Stanning, 29, struggled with fatigue after regaining her spot in the team following a stint in the Army, but she regained her fitness to triumph. "I haven't had the most consistent year so I'm delighted with gold," she said. Glover, 28, said: "I knew we were ready but there was so much expectation, so winning is definitely a relief." Stanning returned to the sport in December and immediately impressed selectors by achieving the best training figures in the squad for the stroke seat. She was moved back into the top boat - the women's pair - alongside Glover with Polly Swann making way despite winning world gold last year. It then transpired that Stanning had overtrained, but despite missing the European Championships, she was drafted back in and went on to win two World Cup gold medals with Glover. "It's my first world title at senior level and comes after a year of up and downs so it's a big relief to achieve what I set out to do. "Now I'm going to take the next three weeks off. I haven't switched off properly for a year now. I need a mental break." Glover, 28, defended her gold medal to ensure she continues to hold all the Olympic, world and European title. "When Heather turned round to look at me after we crossed the line, I was saying 'thanks'," said Glover. "It's something I am really proud of achieving." The duo also broke the world record for the first time in 12 years, sending out a ominous marker to their rivals ahead of their Olympic title defence in Rio. "Getting the world's best time was something we had talked about for ages in training," said Glover. "Heather noticed when we crossed the line and I didn't believe her. That's almost what we are more pleased with." The men's four of Alex Gregory, Moe Sbihi, George Nash and Andy Triggs Hodge won Britain's second gold medal of the day, delivering on their form this season which has seen them go unbeaten since forming a crew in April. "There is more to come, especially technically, and we're only going to get physically stronger," said Sbihi. Double Olympic champion Triggs Hodge added: "This boat has the potential to be the best I've been involved in. "We're still a new crew and have a way to go but without a doubt, what this four can achieve is exciting." The World Championships conclude on Sunday with medal chances for Britain in the men's and women's eight and the men's lightweight four.